just to take it all down and put it all safely away. 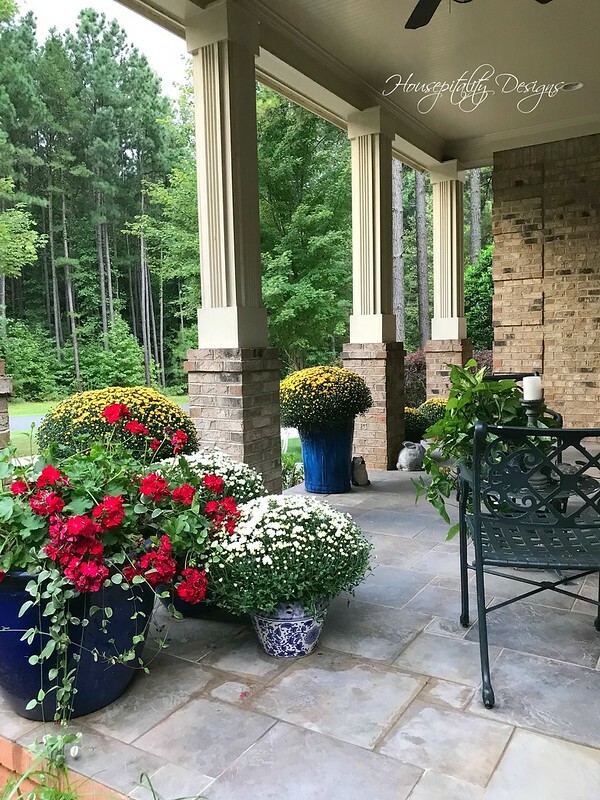 I have to say that it is my favorite of all Fall porches that I have done. I hope to have it posted on Friday….so stay tuned. In the meantime I will give you a sneak peek of it at the end of the post. Today it is all about Fall Reminiscing, Florence, and a winner. 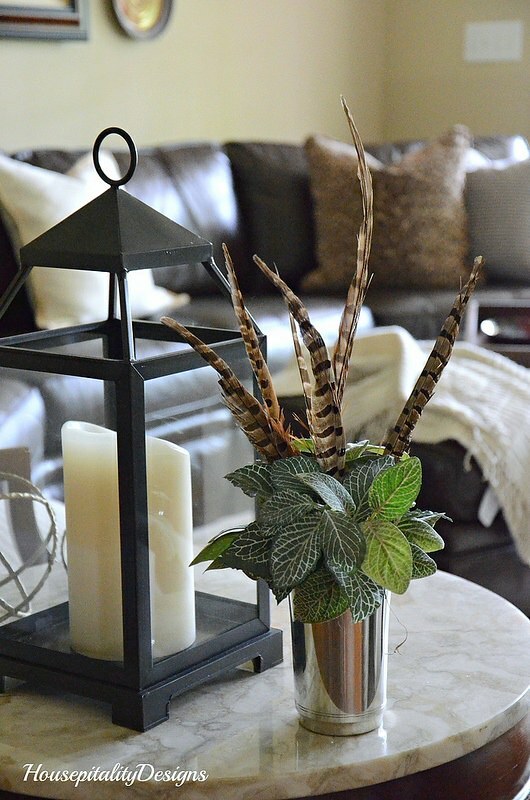 I thought I would reminisce about past Fall decor at my previous home. and when things settle down, I shall show you what I have done. what a beautiful Fall we had last year. Go away Florence! 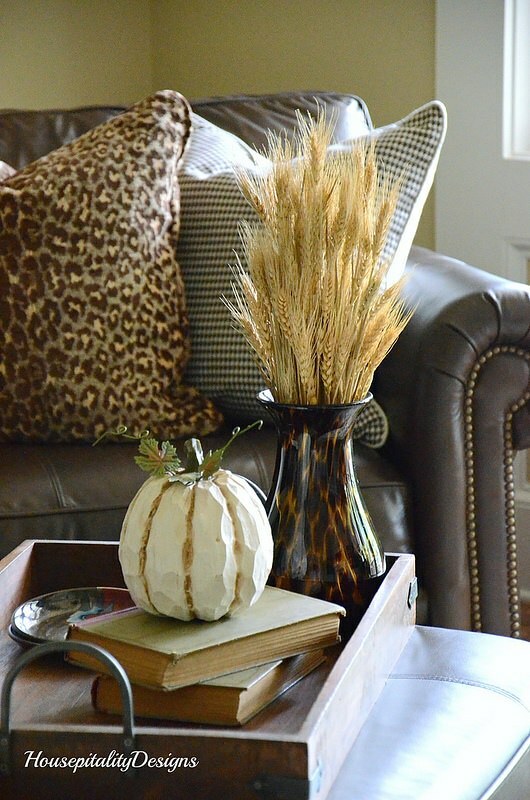 I introduced lots of purple and plum into my Fall decor. 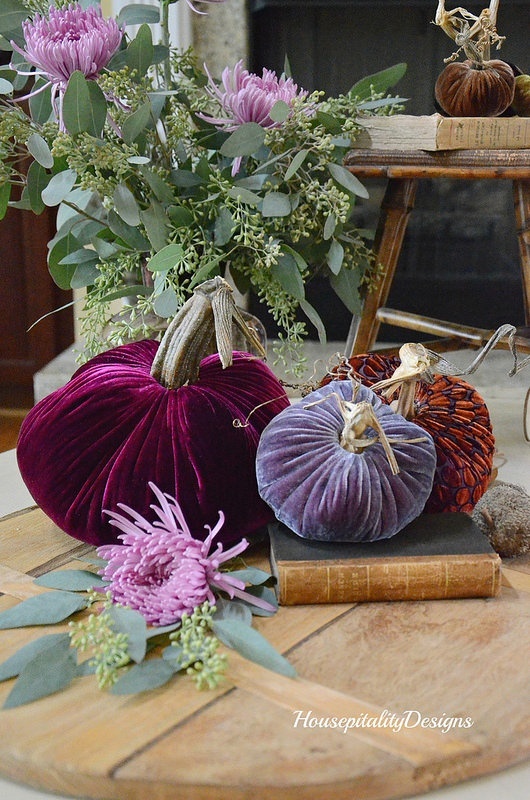 beautiful velvet pumpkins, by Plush Pumpkin. I even used the colors of plum/purples on the porch last year. Yes, I went plum crazy! Here is an image of the corner of my previous porch a few years ago. I loved using my vintage wagon. And here is a sneak peek of the porch of the Berry Patch house. And now the winner of the French Country Cottage book. I thank you all for entering. I will be having more book giveaways in the future. I love giving away my favorite home decor books. My hubby always chooses a number . . . and the winning number belonged to Alycia N.
as we are surrounded by trees . . . lots and lots of trees! Shirley, I loved seeing your autumn decor at your previous home, I remember your beautiful palette of lavenders and plums. The sneak peek at this year’s porch looks amazing. Stay safe dear friend and prayers for all! That’s another nice big porch to decorate. Looking forward to the reveal and I pray y’all stay safe from that storm!! Praying that our Lord and Savior Jesus Christ turns the hurricane back out to sea and if He chooses to let it come inland that He will protect each and every one of His children. Pretty porch decoration you have at the Berry Patch house. Shirley, be safe. Congrats to Alycia. Please check in again once the worst is over. Shirley be safe with the hurricane. I know you must be concerned. I’m praying for all involved. Your porch will be lovely, I’m sure. Can’t wait to see what you’ve come up with for your new porch! Please take care with Florence coming, Shirley. The reports of it even here in CA make it seem like it will be a force to be reckoned with. We’ll be anxious to hear from you. Pretty porch pictures. Berry Patch is looking pretty also! I’m praying, praying for everyone’s safety of Hurricane Florence! We live near Wilson NC and I’ve been preparing. We have lots of huge pine trees close to our house! Stay safe! Such pretty fall reminiscing, Shirley! I loved the purple tones you used last year. You have a gorgeous porch space at the Berry Patch house, and I can’t wait to see it decorated for Autumn. I have been thinking of you and all of those in the path of Florence. Please stay safe, sweet friend! My prayers are with all of those in the path of the storm. Be safe! We are in Durham, but we have a condo on Carolina Beach! Hoping for the best for everyone! I am praying for all of you in NC/SC as the hurricane approaches. It looks like my area (central VA) isnt going to get it as bad as first thought as it seems the hurricane is turning more southward but that can always change. I saw where many who live on the NC/SC Coast weren’t leaving and that makes me nervous. I just pray for everyone’s safety. Shirley, praying for safety and that no damage is done! Praying for everyone in the patch of this storm, blessings to those on the road and those staying at home. May our Lord be with you all. Shirley to you and your family, be safe! Stay safe! I’m praying for all of my Carolina family and friends. 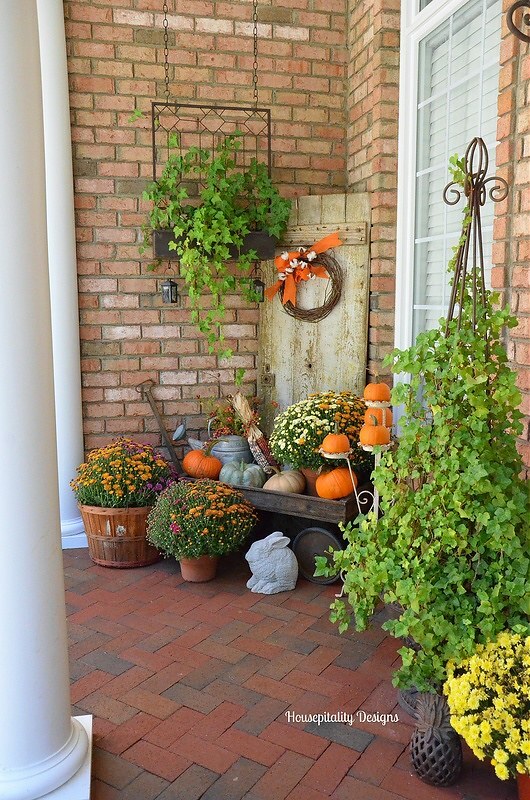 Can’t wait to see the new porch all dressed in her Fall finery! The peek looks great! Loved the look back at the old house too, your plums last year were so pretty. Stay safe. JUST found out this morning that the wedding we were coming to in NC has been postponed til Nov. Thank God cause we were very worried about going. This is a nasty storm, I hope you don’t get anything bad. I’ll be back Friday for sure! Last year fall was lovely at you home. We are hunkering down too. Stay safe! Shirley, enjoyed seeing your porch last year and all your autumn pretties. Pray all will be well with you during the hurricane. Hey Alicia congratulations! I don’t hear from you anymore, I am assuming that all is well. Enjoy your new book. Very pretty Shirley! 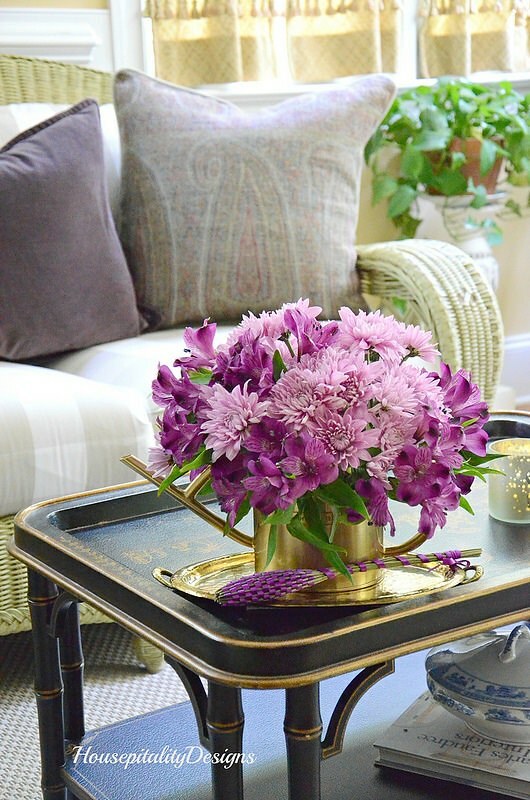 I love the purple mums in the brass watering can. I’ve been glued to the weather channel, as well. We finished our preps a few days ago. I just need to clear off the porches today. Keeping good thoughts and prayers for you and Tom that all will be ok especially with all the trees around you. Let’s hope this storm calms down and does not do a lot of damage for all you. 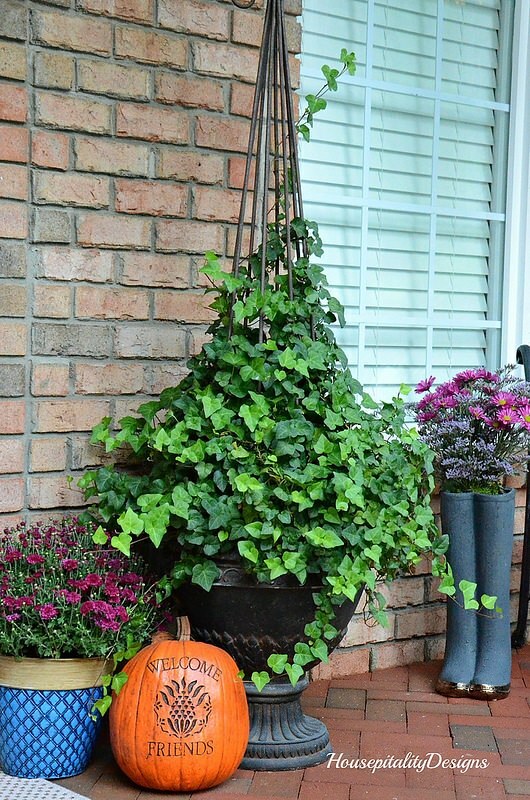 Hopefully after the storm passes you can get your beautiful fall decor back out and on your pretty new porch.